Your science fair project should be your own work. 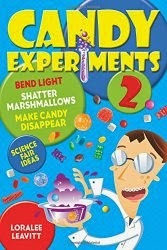 If you use a candy experiment idea, put your own spin on it by testing different candies and writing your own explanation. You must cite my website/book as your source. Don't drink the acid test experiments. Eating too much baking soda can make you very sick. Grownups should supervise melting experiments. Melted candy can be much hotter than boiling water.